I was lucky enough to get out early this morning for a 10.6 mile run. My goal was to get in 10 miles a day this week but I blew that by missing yesterday. We hit a piano bar Sunday night and had a little too much fun, so I had little motivation for fitness. This morning's run was good but started tough. After about a mile I developed a headache in the back of my head that just would not go away for the entire run. I was able to largely shelve the discomfort and enjoy the run on the beach. For the first half I ran on the sand and enjoyed the ocean's early morning symphony. The second half was spent on the beach road for the trip home. Most of the run was spent at or just below a 7:00 pace, with the last couple miles near 6:45. Given the flat terrain, this pace was quite easy. Having said that, I am looking forward to Pineland's undulations! What a difference a thousand miles makes. Thursday night Kelly, the kids and I set out on the first leg of our Myrtle Beach drive, landing in Richmond, VA at 7 AM. The drive took 12 hours and was really difficult. The kids didn't want to sleep and Riley sang Twinkle Twinkle Little Star about 100 times in succession through New Jersey. Needless to say that with no sleep I skipped my run Friday. Saturday we set out for Myrtle Beach and after another 5 1/2 hours in the car, we arrived. We were greeted by the most perfect weather; mid-70s and sunny. Having arrived after 3 PM, there was no run for me on Saturday either. The absence of runs the last few days was well worth the wait for yesterdays run. This run reminded me how much I miss living in the south. Springtime down here is comparable to summertime in Maine. There are few words that can truly describe how perfect these seasons are. The dogwoods, redbuds, azaleas, and so many other plants and trees are blossoming and flowering that you feel like you must be traveling through one big botanical garden. The run yesterday gave me the opportunity to see spring in full action close-up and presented me with numerous sweet smelling flowers whose names I can not produce. The mockingbirds and morning doves provided the aural chorus to the spring slideshow during the road segment of my run and the sand pipers were my audience for the beach portion of the run. The run started out at mid-morning, and I joined Kelly and her cousin, Jena, for the first few miles before heading off on my own. The first portion of the run was done pretty slowly, more for the social aspect of running than for training. The pace was terribly slow but fun. After three miles at 10:00 to 11:00 pace I picked it up and hit a 6:47 on mile 4, which was quite easy given the flatness of the terrain down here (see the elevation profile below). I kept this pace until mile 7 when I hit the end of the public road and the guard at the gated community told me I couldn't soil the rich people's property with my sweaty, runny self (really he apologized that I couldn't pass - nice, southern gent). So I detoured to the beach and continued my run along the beach perimeter of these nice folk's property. They were no worse for my presence. 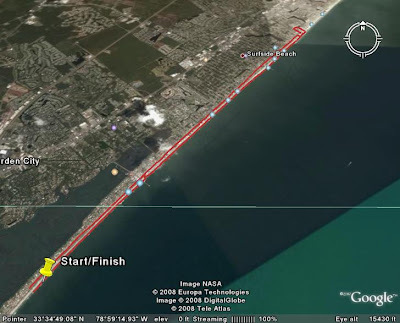 As I hit the straightaway on the part of the beach that I had not run the sand firmed up and my pace increased to sub-7s once more. Mile 9 was covered at 7:00 pace and the last mile, Mile 10, was done at a 6:38, which I thought was pretty good on the beach. 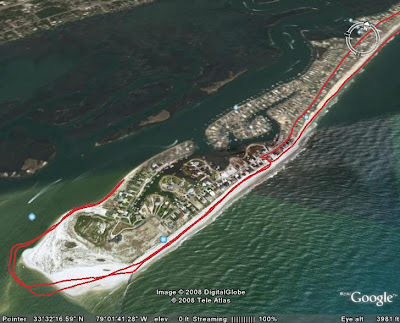 It was fun checking out the satellite image of my run, as you can clearly see that I stayed below the high tide mark (the satellite image must have been taken at high tide) as it appears that I was running on water for most of my run! ...to the beach! Next report from Myrtle Beach, South Carolina after a run on the beach! This past weekend was an exciting one for me. I ran through hail for the first time and got my second tattoo. To warm up for the weekend I got in a couple runs Friday. I knew that if I got out at lunch, it would be a short one so I got up early and hit the treadmill. I got in 5 miles while watching 30 Rock and The Office. I don't know if any of you have seen these shows while sitting down, but if not, it's hard to stay in your seat from laughing. So trying this while running is not recommended and should only be attempted by the most seasoned treadmill runners. As luck would have it, I did get back out for a quick run Friday just after 11:30 knowing I had to make it back by 12:15 for a conference call. After hitting the locker room and getting all dolled up for my run, I had just over a half hour to run and shower before my call, which didn't leave many options for distance. My running buddy, Jim, and I decided on a 4-mile course and hit it at a pretty good pace considering we were both planning on meeting up with the Roasters crowd Saturday morning for a long run. We ran the course in 32:00 for an average pace of 7:23. Because the course was a 1/3 of a mile longer than billed, I was left with three minutes to shower, dress, and make my way to the conference room for the call. This was miserable as it took me roughly 15 minutes to stop from sweating. But I got in a run! Saturday dawned wet. As I was getting ready there were intermittent showers with the occasional downpour mixed in. As I am one that disdains being too wet on a long run, I suited up in all my running Gore Tex and headed out the door. At 7, I met up with Emma, Jim, Blaine, and Jim (L.L.Bean) and we got the run underway in fairly pleasant running conditions. That changed at about the half way mark when the sky turned this violent shade of purple and unleashed a steady barrage of pea size hail on our heads. Luckily I was protected by my Gore Tex sheen and baseball cap but Jim (L.L.Bean) wasn't so lucky with his stocking cap. But he stuck it out bravely and we all made it out unscathed and with good stories to boot. I felt okay during the run; a little sluggish probably due to sporadic running during the week and the double header on Friday. What is most concerning is the high average HR during the run. At this pace I would expect something in the high 140s. Just means I need to get more sleep. At any rate I got in less miles than I originally planned for due to having to be home to help cover for some work Kelly had to do Saturday morning. It was all for the best as the top of my big toe started killing me at mile 14 as we descended the hill down to Falmouth Town Landing. I attribute this to my footwear choice. I decided on a Nike Gore Tex shoe that I have had for probably over four years and which aren't all that great of a road shoe. So I sacrificed my toe to keep the rest of my foot dry. Not a good choice. The toe is still killing me when I walk around but feels fine while running. Needless to say, I will make a better choice of footwear in the future. The rest of Saturday went normally until I left for my tattoo appointment. At 3 PM I met Beth at Tsunami Tattoo to get inked. I had been talking with her for a few weeks on a design and when I arrived Saturday she was all ready for me. I sat down in the chair at near 3:30 and besides a short stretch break after the outline was done, I didn't get up until about 7:15. That was a long time to be under the "knife" so to speak. Despite the high level of discomfort the needles visited on me (the gun used to color in the tattoo had seven needles), I will say that the experience was a pleasant one and the folks at Tsunami Tattoo do a fantastic job. If you are looking to get some work done on your canvas, look no further. And for all you nonbelievers, I challenge you to think of any product you might buy that is truly guaranteed for life! "Mutilation" or not, Blaine, but it costs pennies on the dollar and will last forever. A good investment in my eyes! Since then I have run a couple treadmill runs in between spring lawn care, packing for our trip to Myrtle Beach (we start driving down Thursday night), and work. Sunday night I got in a comfortable 5 miles and last night I ran 7 miles, both at a near 7:30 pace. Below is a YouTube video from a band whose CD I head for the first time while getting my tattoo done. Check them out. You won't have many opportunities in life to experience a 29 member (!) Swedish pop band. Enjoy. Following Saturday's run of 24 miles, I hit the treadmill Sunday night for a moderately paced 7 miler and then got out doors Monday during lunch. What was special about Monday's run was that I wore shorts. It felt so good to be running out of doors unencumbered by tights. The temps were great and the sun did its job perfectly. Monday's run featured my entire L.L.Bean crew: Ethan, Jim and Tom. Mike is still rehabilitating his knee but he did start running last week after months off and he will hopefully be back on the roads sometime this summer. The conversation was good and centered around weekend training and upcoming races. Jim and I are both doing the Pineland Farms Trail Challenge (Jim's first ultra) and the Mount Washington Road Race ("only one hill"), so a bunch of our conversation is centered around these events. Tuesday I took off and rested my legs. I am still in a building phase so 50 mile weeks still requires my respect; that means rest days. Today was another beautiful day and I once more sunned my legs. I joined Jim for a run that largely mirrored Monday's run. The last week of great weather has been kind to the greenery on our run. It is great to see something more than snow. As spring refreshes the world, it also remotivates my running. I can't wait for those early morning long runs on the weekend. Pineland closed its trails to skiers last week and now it is only a matter of time until the trails belong to the Trail Monsters! Upcoming this weekend is another long run on Saturday at Maine Roasters Coffee. I am planning on joining Ian, et. al. for another run on the roads. That is if the weather holds out. Life comes at us in cycles as does the weather. For all these great days, we have to pay for them sometime and it looks like payday is Saturday. Rain and a high in the upper 30s is forecasted. If that is the case, I might choose the treadmill. I like to suffer and willingly subject myself to painfully long runs, but I have limits. Rain and cold is a recipe for serious suffering so we'll play it by ear. On the more exciting front, I have a tattoo appointment Saturday afternoon and a week later we will be sitting on a beach in South Carolina! This week was like many of the previous weeks; 5-6 mile runs during the week with a long run on the weekend. I ran a short 5-mile recovery run (from Sunday's 20 miles) Monday night in the basement. I felt terribly week the first couple miles before I decided to run upstairs for an energy bar. I felt better almost immediately after ingesting the food and the rest of the run went swimmingly. I find myself with somewhat of a stunted appetite the day of a long run with the constant mad dashes to the refrigerator happening long run +1 day. Tuesday was my birthday (was of those uneventful near mid-30 birthdays) so I took the day off. Wednesday and Thursday were more of the same, but slower than typical mid-week runs, which felt good so I went with it. Friday I took off to hang out with a buddy who is leaving L.L.Bean for greener pastures! Today was the big show. I was extremely fortunate enough to get the time this morning to join Ian, Emma, James, Jim Dunn, and a large group of Maine Track Club members for their weekly Saturday morning Maine Roasters Coffee run. The run started with a light drizzle and temps in the mid-30s and ended near 40 degrees, some 3 hours and 20 minutes later. The large group quickly broke into pace groups with our group of 7 (included the above mentioned group and a couple others including a neighbor of mine who I met for the first time this morning) in the front pack. The goal distance of our group fell into three categories: 16 miles, somewhere in the middle where I was all alone, and 24 for Emma, James, and Jim. The run was great with excellent conversation throughout as we toured Falmouth, Yarmouth, and Cumberland. Most of the talk was around our early season goal races; Emma focusing on her first 50 miler at the Pineland Farms Trail Challenge, James aiming for his second 10-miler at the Massanutten Mountain Trails (where I am currently 32nd on the waiting list), and Jim on a variety of gnarly trail races in Mass and NH. Throughout the entire run I was vacillating on distance, unsure of how far I wanted to go. The determining factor was the people. I had such a great time to once again be on the road (prefer trails) that I stuck it out for almost the entire run of 24 miles. I say almost because we passed the starting point of Maine Roasters Coffee at 23.68 miles and that was good enough for Jim and me, whereas James and Emma felt the need to run out and back to get their .32 miles. For me, the coffee and chocolate croissant was calling and I heeded their call! The pace was pretty even for the entire run, averaging 8:27. There were a couple faster miles including a sub 7:00 mile as I sprinted to catch the group at mile 7 after I darted into the woods for a bio break. My average heart rate of 151 bpm was very high considering our pace, but I will write this off to an extreme lack of sleep the past week and a half as Quinn has had a cold and is getting in 4 (!) new teeth. Also of interest is that there was an elevation gain/loss of 2,310 feet during the run. 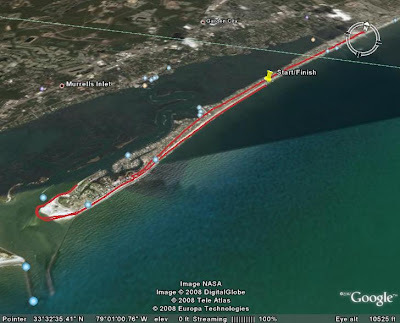 For fun,here is a satellite view of last week's 20 miler.